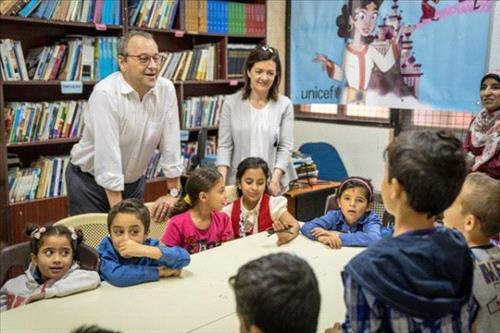 AMMONNEWS - UNICEF's Regional Director Geert Cappelaere expressed his gratitude to Jordan in affirming the rights of all children at the end of a two-day visit where he met with Prime Minister Omar Razzaz and high-level government officials, according to a statement by UNICEF. Accompanied by UNICEF Jordan Representative Robert Jenkins, Cappelaere also applauded the government's renewed commitment to ensure access to education to all children, regardless of their status or nationality. In a meeting with Razzaz, Cappelaere expressed UNICEF's continued support and commitment to the Kingdom and pledged that the organisation would continue vigorous efforts to mobilise international assistance to reach all vulnerable children, according to the statement. Noting that a robust social protection system is a necessary foundation for equity and social justice, UNICEF also announced plans to support the Ministry of Social Development and National Aid Fund to expand cash assistance to serve an additional 75,000 vulnerable families and enhance access to basic services. 'I would like to commend Jordan and the Jordanian people for their generous response to the Syrian crisis. At the same time, the international community should not forget the needs of all vulnerable children and the importance of strengthening government systems and structures, and to address the current challenges and build towards continued prosperity and positive change,' Cappelaere said in the statement. Capperlaere and Jenkins also met with the Minister of Education Azmi Mahafzah, Minister of Planning and International Cooperation Mary Kawar and Minister of Youth Makram Qaisi. On the agenda was UNICEF's commitment to continue supporting Jordan's efforts to ensure increased access to early childhood education, further engagement opportunities for youth and an end to violence in schools. 'UNICEF is working closely with the government of Jordan to support the most vulnerable children and households in the country, regardless of status or nationality, and our increased focus on strengthening national systems will ensure the sustainability of our response for future prosperity and well-being of the youngest in society,' Jenkins said in the statement. The UNICEF regional director concluded with a visit to a UNICEF-supported Makani Centre in East Amman, where he met with vulnerable children receiving integrated learning, youth life skills and child protection services.